Welcome to Day Twenty Three of the 31 Days of Organizing Tips series! I'm so glad you've joined me. 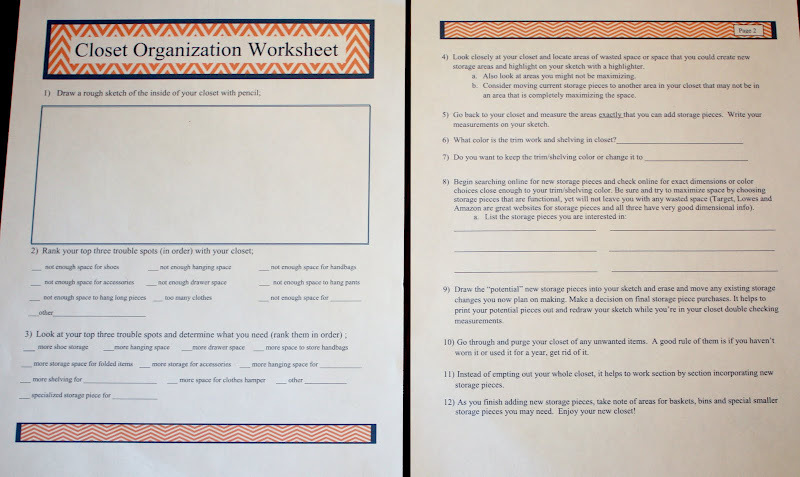 Throughout this series I'll be sharing organizing tips that will help you on your journey from overwhelmed to organized. I'll include lots of pictures and links for ideas that I've found around the web that relate to the topic each day. 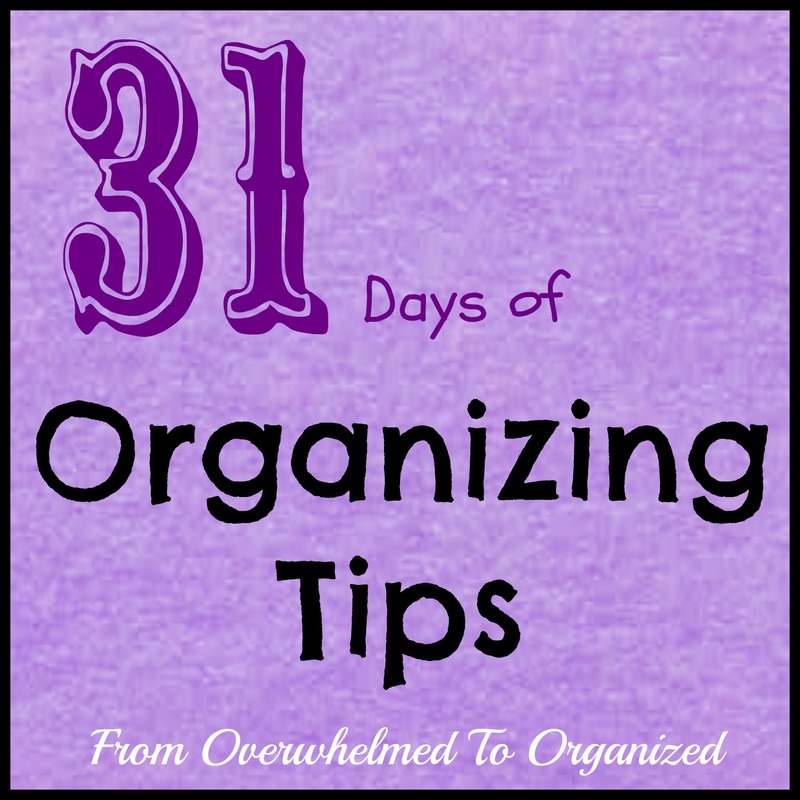 You'll find a complete list of all the posts in the 31 Days of Organizing Tips tab above, or at the end of this post. Yesterday I shared tips for organizing your master bedroom. I had originally planned to include the master closet in that post but there are so many great tips for master closets that I decided to devote a whole post to the subject. Master closets can make such a big difference in how your day goes. If your closet is chaotic and cluttered, it makes it hard to find what you're looking for in the morning, which can get your day off on the wrong foot. Also, it's easy to overlook some items of clothing because you have so much crowded into your closet. That can lead to only wearing 20% of your clothing 80% of the time, like I mentioned yesterday. 1. Purge! Your closet will feel less overwhelming if there is less in it. 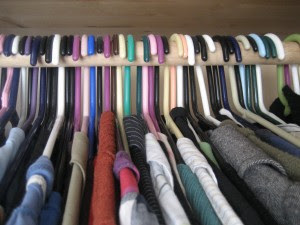 Here's a great tip for purging hanging items: Hang your clothes backwards at the beginning of the season or the year. As you wear them, switch them around and hang them forwards. At the end of the season or the year, give away any clothes that are still hanging backwards since you didn't wear them at all. This is really helpful if you think you wear things but really don't! 2. Similarly for shoes! 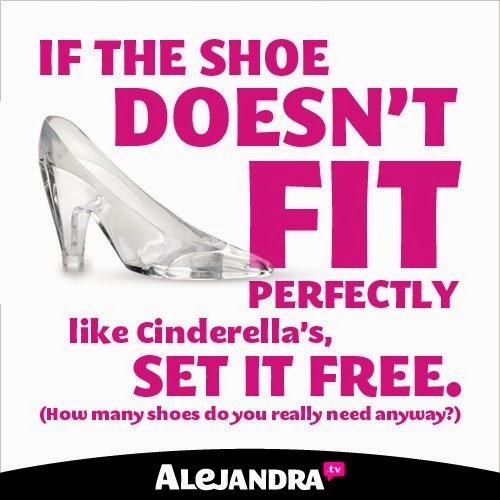 How many shoes you have is a matter of personal preference (and budget!) but no matter how many shoes you have, chances are you don't wear some of them very often (or at all!). If your shoes are overwhelming you, it's time to purge. Shoes that are out of style, worn, dusty, or don't fit well should be donated. 3. Make a plan for how you can best use your master closet space. Determine what your storage needs are (hanging areas, shelves, drawers, shoe racks, etc.). Figure out what items need to be at what height (up high, at eye level, or down low). By taking time to plan your closet out, you will get more out of your space which will save you time on a daily basis. 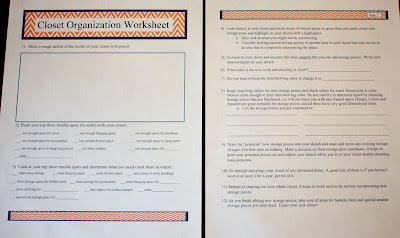 Cyndy from The Creativity Exchange has shared a free printable closet organization worksheet as well as tips and tricks for organizing any closets. Click the link below this picture to download it. 4. 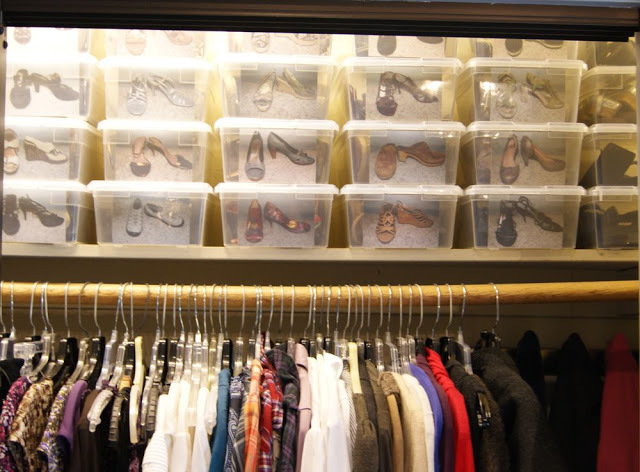 For shoes you keep (after you complete step 2), store them in a way that keeps them visible so you don't forget what you have and are more likely to wear them. You can use various back-of-the-door shoe pockets for this or hanging shoe organizers. You can also put shoe racks on the floor or on shelves. Plastic shoe boxes are great for organizing your shoes. You can take pictures of the shoes and then stick them to the box so you know what is inside. Click the link below this picture for a tutorial. 5. Use the same style hangers throughout your closet and hang all your clothes facing the same direction. 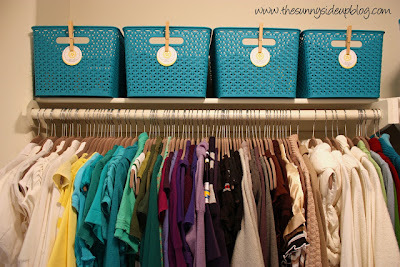 This saves space, looks nice, and keeps your clothes organized better. The style of hangers is up to you and will depend on your taste and budget. 6. Sort your clothing by colour. It looks pretty and motivates people to keep their clothes organized, which is a good thing. It's also easy to see what you have or need and makes it easier to pick out your outfits. However, a word of caution: for some people sorting by colour becomes more important than grouping by function and then I don't think it's worthwhile. You know yourself, so decide what will work best for you to keep your clothes organized! 7. Maximize vertical space. Shelves with baskets or containers can increase storage in otherwise wasted space. Here's a DIY idea to use a small wall for baskets. 8. Put hooks on the back of the closet door(s) for items you use frequently such as robes, belts, purses, bags, hats, or even the next day's outfit. Well this post has gone on long enough already and I haven't even touched on all the creative ways you can store jewelry, ties, and scarves! I will share some tips for these items later in the series when I do another DIY ideas post and will also be sure to include them in my "Organizing Ideas for the Weekend" series in the future. 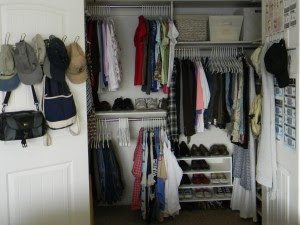 For Day Twenty Three, purge your closet and then choose one of these tips and put it into action in your master closet. There are lots of cheap or DIY organizing ideas so don't let money hold you back from getting that relaxed feeling when you open your closet doors! And you don't need to replace all your hangers today if you choose tip 5 :) Wait for sales and coupons for the style that fits your budget and gradually change your hangers over until they all match. Tomorrow we'll look at more tips for organizing other spaces in your house. I look forward to going through the rest of this series with you and hearing your tips too! 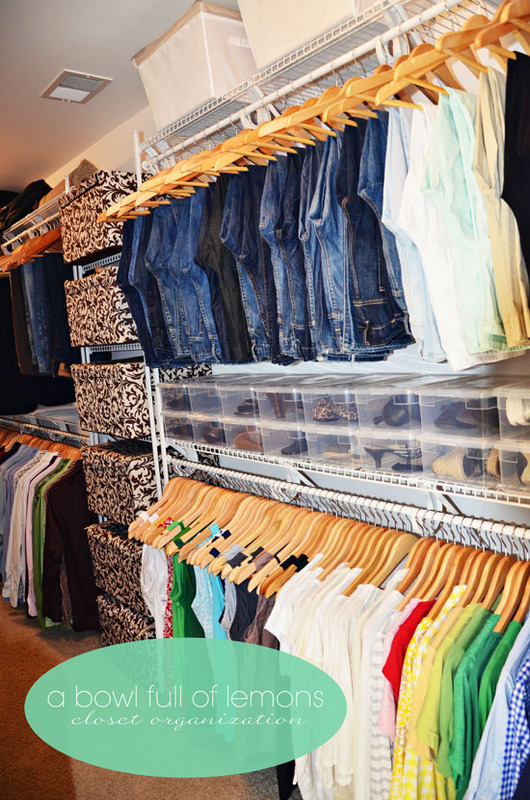 How do you organize your master closet? What's the best organizing tip you've implemented? Every time I stop in here you are working on an area I need to work on. Maybe it's because I need to work on everything! Great tips! We - ok *I* - have way too much clothes. Not sure if it all fits anymore AND I have a hard time parting with them b/c I paid $$$ for them. Most of it is office casual and all I wear now are jeans & tee's. It's tough to part with things that we spent our hard-earned money on Helen. I'm the same way with all the books we've bought over the years! Maybe you can sell some of your clothes to help offset some of the cost. If you're not using them, it's draining looking at them every day and the emotional cost isn't worth hanging on to them. It's so freeing to have that space back for yourself!